Babak Anvari's feature debut Under the Shadow has been earning rave reviews as it tore through the festival circuit this year. The trailer for the horror flick is here and you can watch it below. 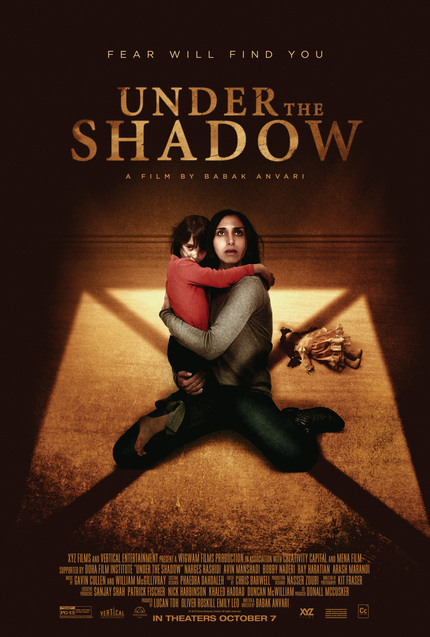 In Under the Shadow Shideh is a stay at home mom looking after her daughter Dorsa. Her husband is sent to the front lines during the Iran Irag War in 1988. That is when the trouble begins. Director Babak Anvari, who makes his feature debut with this Sundance-premiered film, weans scares and ideas a plenty throughout the film, yet perhaps his single greatest tool is actress Narges Rashidi. Playing the strong-willed and unwilling housewife, Rashidi conveys a potent feeling of perseverance mingled with helplessness. While the scares in the film are not necessarily new, and many will compare the setup to recent Australian horror hit The Babadook, Under the Shadow has a handful of genuine jump-out-of-your-skin moments that will be hard to shake off. Also, in a rare feat for a jump scare horror, Anvari's film nails the landing, with a strong message and a quick exit.